Today, Meghan and Harry were together again to visit Bristol, where they toured some of the city’s iconic landmarks. 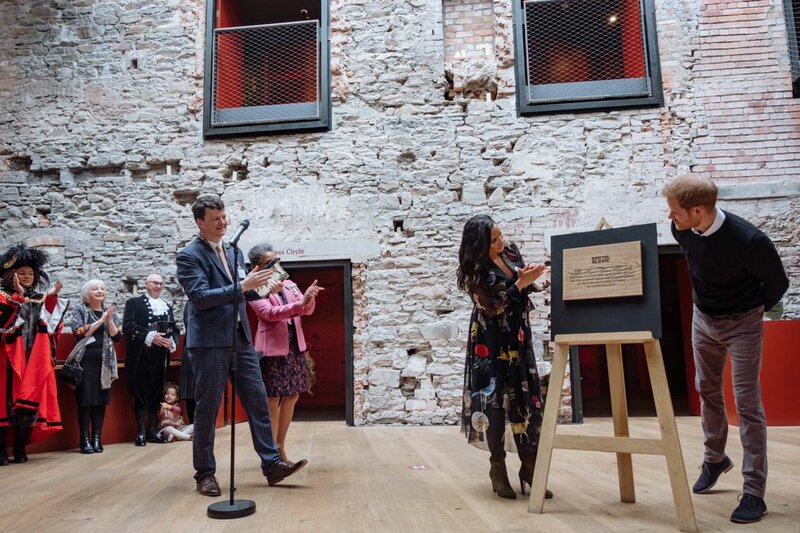 They visited the Bristol Old Vic, the oldest working theatre in the English speaking world, and Empire Fighting Chance, an organization that supports local youth through non-contact boxing. 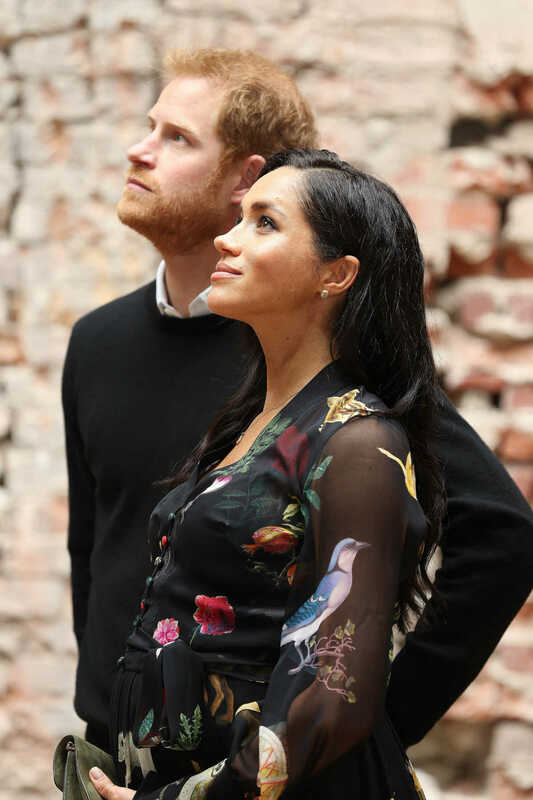 The goal of today’s visit was “to meet members of the public, learn more about the city’s rich cultural history, and visit organisations supporting communities most in need.” Meghan and Harry had a thorough tour of the area, and took the time to meet the hordes of locals who came to greet them. For such a busy day of events, Meghan chose a flirty, floaty midi dress from Oscar de la Renta. The quirky print was perfect for a day of meeting with local youth in the Bristol area. To keep warm in the snowy weather, Meghan chose a unique coat from William Vintage – a London-based company specializing in vintage haute couture. The look was tied together with green boots from Sarah Flint and a green clutch, which we saw previously at Prince Louis’ christening. Meghan left her hair down today, after two back-to-back updos, in loose, romantic waves swept to one side. Overall, this look was a smashing success, and suited the variety of engagements planned for the day. 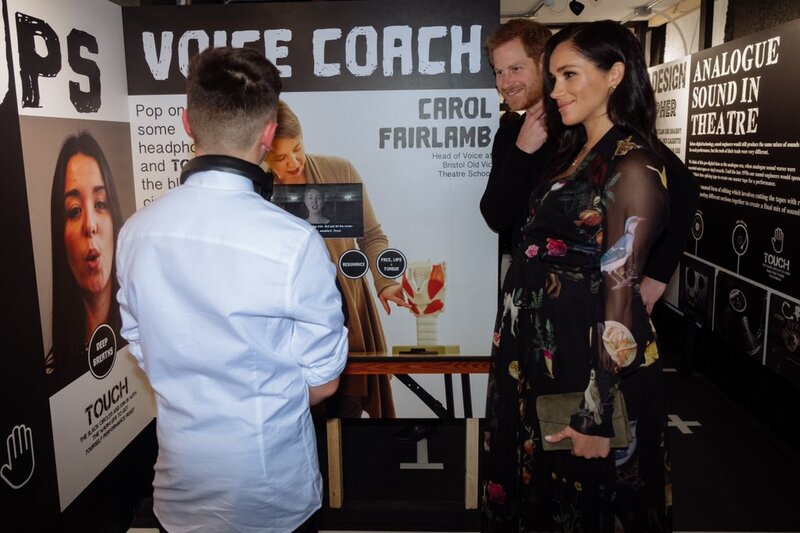 What did you think of Meghan’s look for her visit to Bristol? 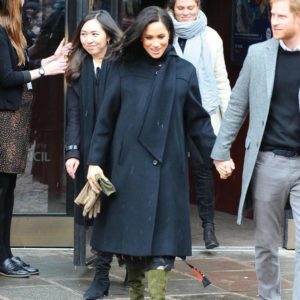 What do you think of Meghan's look for her visit to Bristol? I like the individual pieces but I’m not sure about how it’s all put together. I must say her hairstyles have been on point over the last three days. I hope to never see a messy bun again ??? – don’t attack me please!!! I agree that it’s been super fun to see her change up her hairstyles this week! And I tend to agree about the outfit….the dress feels a bit too light and airy for the suede boots. Although I’m sure she was attempting to keep her feet and legs warm in that weather. The print is definitely different from what we usually see! It has been fun seeing her so much this week. We are loving the variety of hairstyles, too! LOVE Duchess Meghan’s look today! 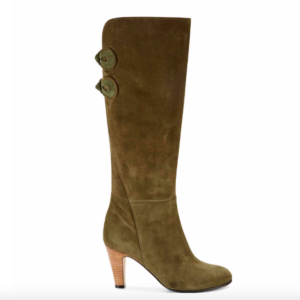 I was literally eyeing the same exact Sarah Flint boots on her site yesterday so I couldn’t believe my eyes this morning when I saw Meghan in them! Although I’m not usually a fan of the Duchess in (floral) prints, I love the quirky, bold print with various birds, etc on the Oscar de la Renta dress. The floaty cut of the dress paired with the olive green boots is perfect and flatters her so well now that the baby Sussex bump is much more pronounced. In Meghan’s Hollywood days., she experimented with a side hair part more often for the red carpet, so it’s nice to see it back here paired with the loose flowy waves of her hair down. I love the quirky print to this dress, too! The snowy setting makes the mostly romantic backdrop. How lovely the pictures of the couple are! I LOVE how Meghan is a working woman and embarks on so many solo trips. I have to say, I just love seeing the two of them together though – they make for my favorite outings and outfits! Seeing their love on display is beautiful. Was looking forward to this one and it has been so charming! The snow made it feel very magical today! Loving this look today!!! I’m generally not a fan of prints but I really like this one, for one it’s a dark print so more subtle and the print doesn’t cover every inch of the fabric. I am having serious issues with these boots as I want them soooo badly ?. I checked out the Sarah Flint site and found several pairs of shoes I want, time to start saving up!? 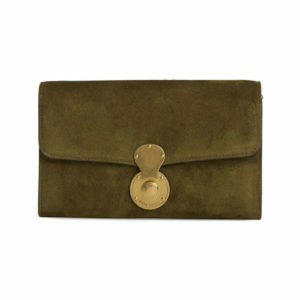 Thanks MM for a great post! I love that the goal of the Duke and Duchess’s visit to Bristol was: “to meet members of the public, learn more about the city’s rich cultural history, and visit organisations supporting communities most in need.” I completely agree about the snow (I personally love the snow), it really just gave a beautiful magical, olde England feel and the pictures with it falling are beautiful. Whilst I am not a fan of the strong bird print, I love the flowy, feminine material of the dress and own several similar styles but with a floral print. Those gorgeous Sarah Flint boots are the standout in her ensemble for me. They would look amazing with jeans as well. The hair and makeup are beautiful and it has been wonderful to see Meghan supporting and championing such great causes over these past few days. 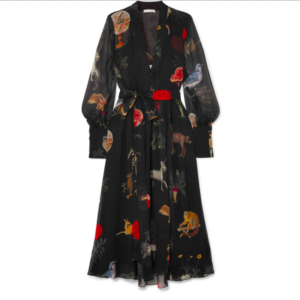 I am shocked that I like this dress, because while I love a good print, for some reason, I absolutely hate clothes with animals printed on them (I love say, leopard print, but I am not into the whole leopard appearing on a sweater or whatever). But the colors and the construction of the dress appeal to me for some reason. I like how she looks with the coat and the boots but the dress and the boots don’t get along! And then the hair…no I don’t like it . The Duchess looks lovely. I like the colour of boots and bag. What a great organisation. Nice to see them both among the people who waited in the snow, to see them and have a quick chat. I feel like I am constantly leaving somewhat negative comments lately , so I do want to say how much I admire the confident, intelligent and lovely Meghan! But given this is a style site, I find I am not able to gush over her recent outfit choices as much! I do love the individual pieces of this look but the whole ensemble is a mismatch to me. It started so well, the warm coat and suede boots – tick! And at least today she took off the coat once indoors. The dress is very pretty on it’s own, but floaty fabric and heavy suede boots just do not complement each other imho. That dress deserved different shoes, and while the clutch is pretty, it’s somewhat small in scale and impractical to always have to carry it. Looking forward to the next outfit! She looks absolutely amazing. I love the dress!! But why do I have the feeling looking at her that she will give birth verry soon? I don’t know what it is, but her face is changing… Something is telling me that the baby will arrive earlier than expected. Gigi, I agree I try to offer positive comments and not to appear too negative. I like the dress but I don’t think it pairs with the heavy boot. 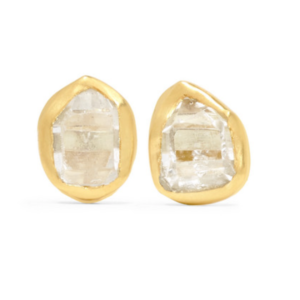 I like all the pieces separately but I am not so sure they work together. It was very cold in Bristol so the boots and coat were en pointe for the venue; the floaty dress not so much. Her hair looked lush! I think we are going to see a March baby! Writing on bananas with a Sharpie? Hmmm. I like her hair, and the coat and boots look good together, but I agree with those who have said that the dress with the boots is a miss. I seem to recall that last winter she often wore pants when out at these types of meet and greets. Maybe her pregnancy is making her feel hot all the time, but pants are what look seasonally appropriate to me in the winter. Floaty dresses in summer prints or light colours (as in the beige we saw a few days ago) just look off at this time of year. In general I am finding that her look lately is a miss for me. Blah, mismatched, or ill-fitting. I hope to see an improvement after the baby is born. I agree with many of the others about the dress not pairing well with the heavy suede boots, which are stunning, btw. The style of the dress is good but I think the print is actually hideous. I do love the clutch, coat and gloves. Very nice touch. Her hair looks really good and I, too, am hoping she’ll continue with chic updos instead of the messy bun look.